Wow! 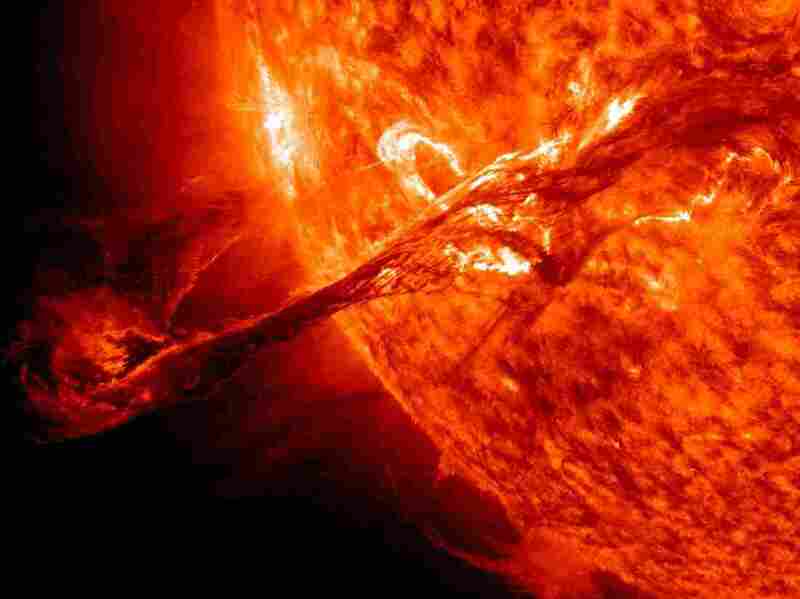 NASA Video Shows 'Mind-Bogglingly Gorgeous' Solar Eruption : The Two-Way Watch as a massive flare shoots from the sun and stretches a half million miles into space. Friday's event dealt Earth's magnetic environment a "glancing blow," NASA says. Before we run through the news of the day, let's pause for something spectactular: a new video from NASA's Solar Dynamics Observatory. It shows a "massive filament" eruption on the sun that occurred last Friday. As Britain's The Register says, it is "mind-bogglingly gorgeous." The eruption apparently stretched out a "half million miles into space," The Register adds. Fortunately, the sun is about 93 million miles from us. And, says NASA, the eruption "did not travel directly toward Earth," though it did give a "glancing blow" to the planet's "magnetic environment" on Monday.